2014 was an intense (and successful) year for word·play, as well as in my "regular" job and life. I sacrificed a lot of things to keep on schedule with my editing clients, and I'm excited for the growth of my company, but I realized at the end of the year that I sacrificed a bit too much. My goals and expectations for success were not only overwhelmingly high, but honestly unnecessary. 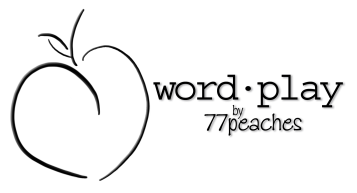 So I'm focusing on maintaining a balance between all my endeavors in 2015.
word·play now offers proofreading services. Check out the services page for full details, including pricing and scheduling. © 2016 77peaches enterprises, llc | word·play is a division of 77peaches enterprises, llc | All original content © 77peaches enterprises, llc. All content related to published material (art and text) is used with permission from the respective author and all relevant copyrights are implied.